The 2018 Water Year was pretty good for Idaho overall. The hydrologic system was still benefiting from the extreme moisture received the previous year which provided excellent reservoir carryover and above normal streamflow through the fall and winter. 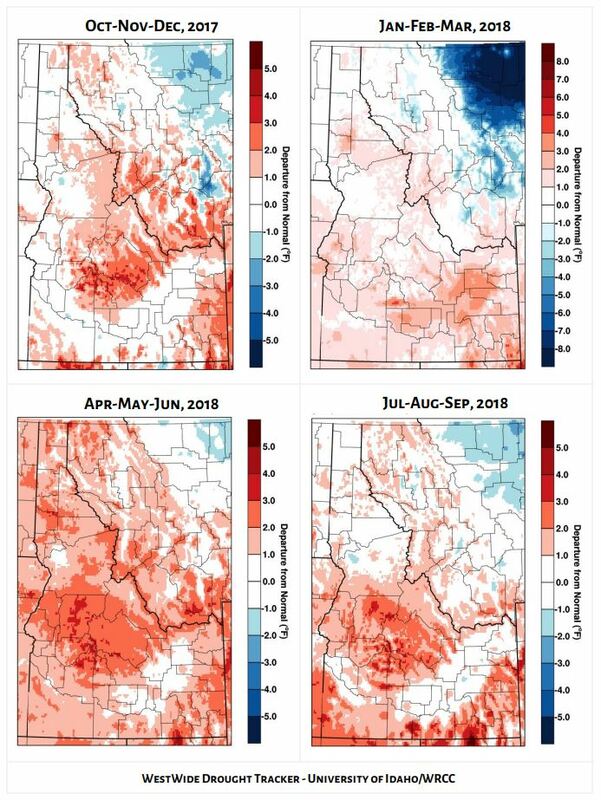 Precipitation patterns favored northern Idaho and portions of the Upper Snake Basin in eastern Idaho, resulting in normal or above normal precipitation for these regions. By winter’s end, basin snowpack percentages for these areas were around 120 percent of median. Large snowpacks in adjacent areas of British Columbia and western Montana helped set the stage for spring flooding across the Panhandle region. In contrast, precipitation was subpar for much of southern Idaho with some locations receiving only 50 to 70 percent of normal. The Owyhee Basin in far southwest Idaho had the lowest snowpack percentage in the state at 45 percent of median. Dry and very warm conditions through the summer brought a return of drought conditions to the Panhandle region while drought conditions expanded near the Nevada and Utah border. Streamflows fell below normal in a number of basins from late spring through summer as very dry weather persisted. Mean temperatures for the 2018 Water Year were above normal for almost the entire state. The southern half of Idaho, particularly the higher elevations, experienced the greatest anomalies with much of the area in the top 10 percentile. Fall and winter temperatures were normal or slightly below normal for the northern half of Idaho. 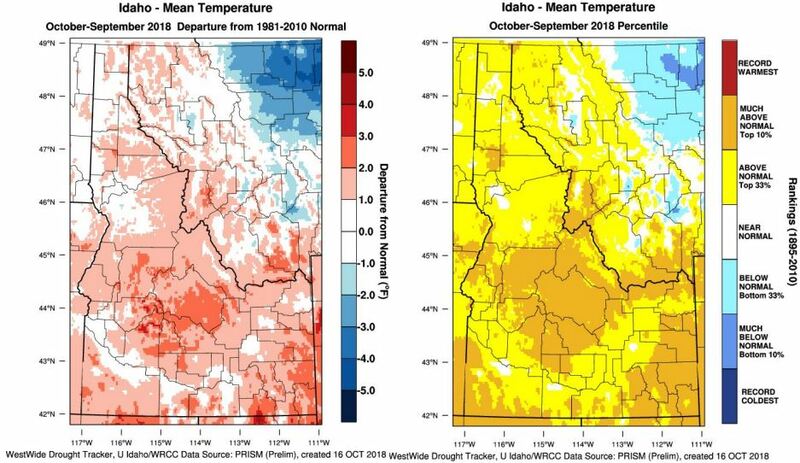 Meanwhile, fall temperatures across the southern half of Idaho had a warm tendency. Springtime brought above normal temperatures to the entire state which spurred a strong snowmelt runoff for northern Idaho and portions of eastern Idaho. Summertime temperatures were generally around normal across the northern half of the state while southern Idaho experienced above normal temperatures. 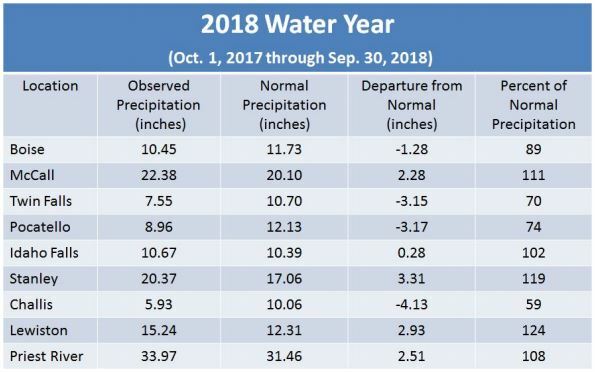 The storm track favored northern and central Idaho during the first quarter of the 2018 Water year resulting in normal to above normal fall precipitation across the northern half of the state. 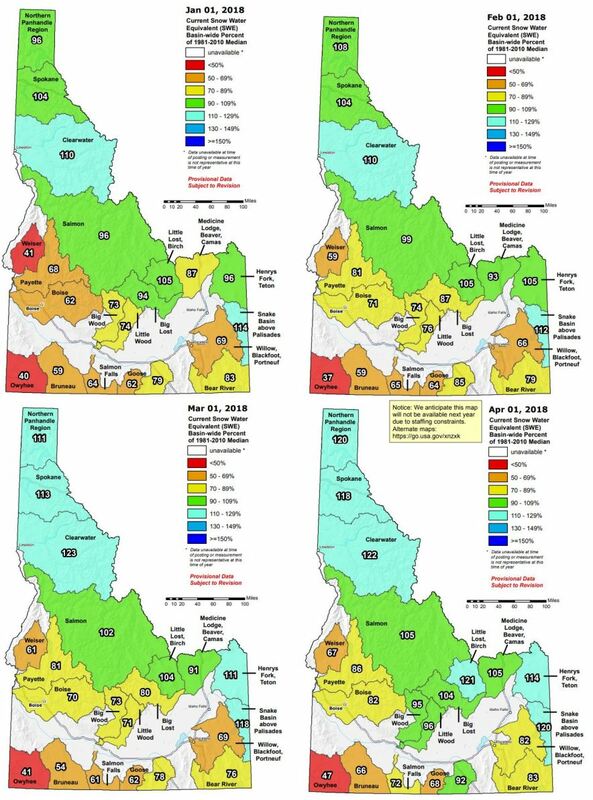 Most of southern Idaho wasn’t as fortunate and started the water year off rather dry. 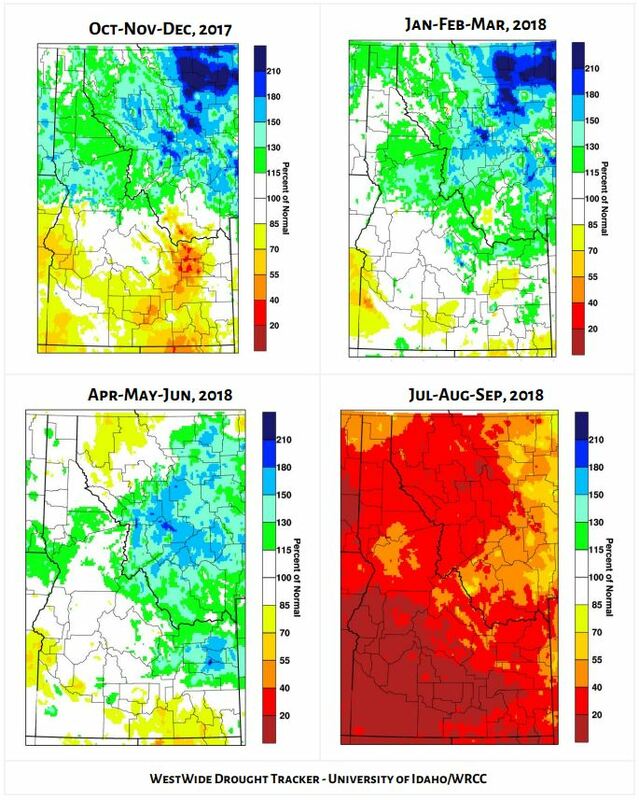 Precipitation patterns continued to favor northern and central Idaho along with much of eastern Idaho during the winter and early spring. This served to build a healthy snowpack in these areas and set the stage for a good runoff season. Across southwest Idaho winter precipitation lagged considerably which raised concerns for drought and agricultural water supply. By the end of June, hot and dry weather typical of summer settled in across the state and very little precipitation was received through the remainder of the water year. Although a small percentage of annual precipitation occurs during the summer, it was an exceptionally dry period across the state. 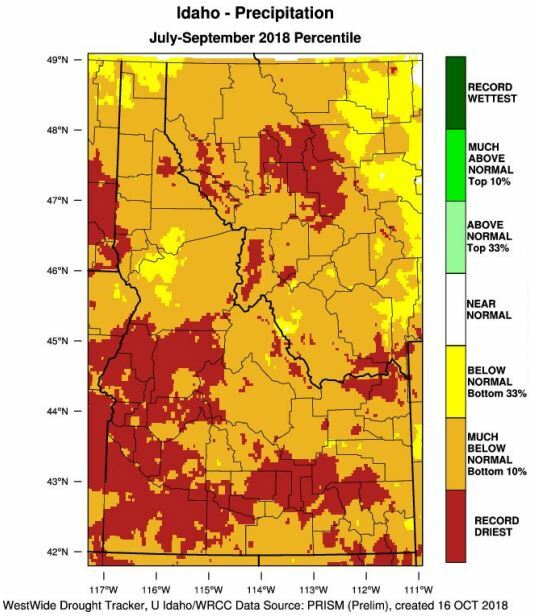 Almost all of Idaho was in the bottom 10 percentile for July through September precipitation and many areas experienced near-record dryness. For example, Lewiston experienced its 6th driest July through September on record. By late winter a robust snowpack accumulated across northern Idaho, portions of the Upper Snake Basin in eastern Idaho, and adjacent areas of western Montana and British Columbia. In contrast, much of south-central and southwest Idaho missed out on a lot of the winter storms resulting in a subpar snowpack, especially near the Utah and Nevada border. 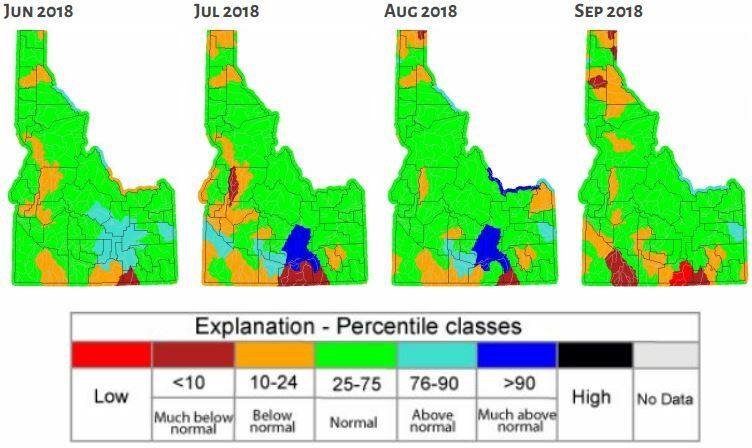 By early April, when Idaho’s overall snowpack typically peaks, basin percentages were around 120 percent of median from the Panhandle region south across the Clearwater Basin, and across portions of the Upper Snake Basin. In south-central and southwest Idaho, snowpack percentages dropped off to around 70 percent of median or less. The Owyhee Basin had the lowest early April percentage at 47 percent of median. 2017 set the stage for the 2018 runoff season. With the exception of a couple basins, streamflows for the 2018 Water Year started strong and were normal to much above normal through the fall, winter, and spring. Abundant water in the hydrologic system kept water flowing in some streams that are typically dry during the fall and winter, such as lower reaches of the Big Lost River in eastern Idaho. Rapid melting of the large snowpack and full reservoir systems pushed spring snowmelt flows to much above normal for portions of the Panhandle, Central Mountains, and upper Snake River regions. As a result, spring flooding occurred across portions of the state, especially the Panhandle region. Despite the strong spring runoff for much of Idaho, streamflows fell below normal in many basins from late spring through summer. Reservoir storage got a head start due to excellent carryover from the previous water year and most major reservoir systems were able to fill. Large snowpack in British Columbia, western Montana, and northern Idaho resulted in near-record or record high runoff prompting large flood control releases on some river systems. Even in parts of southwest Idaho where lower snowpack resided, large reservoir releases were necessary to accommodate high snowmelt inflows. 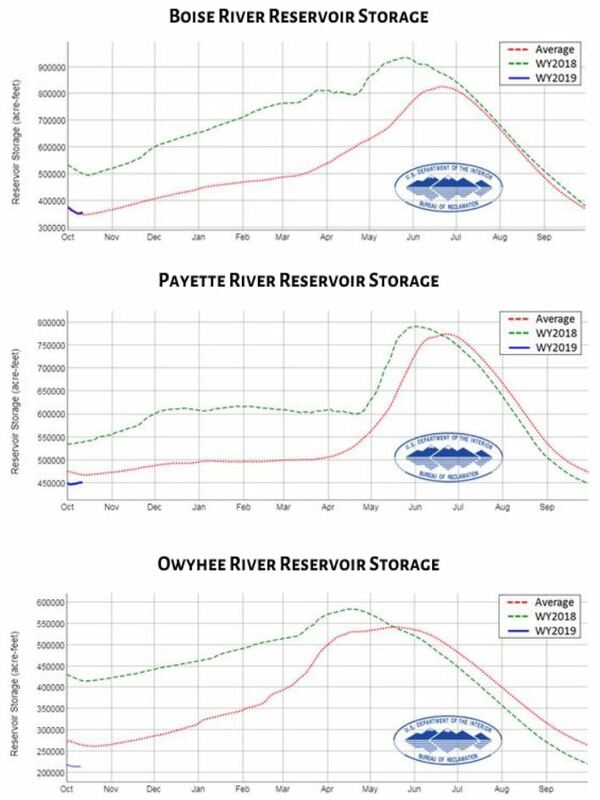 As the irrigation season hit full stride reservoir systems were drawn down near a normal pace and ended the water year with near average carryover for the next water year. 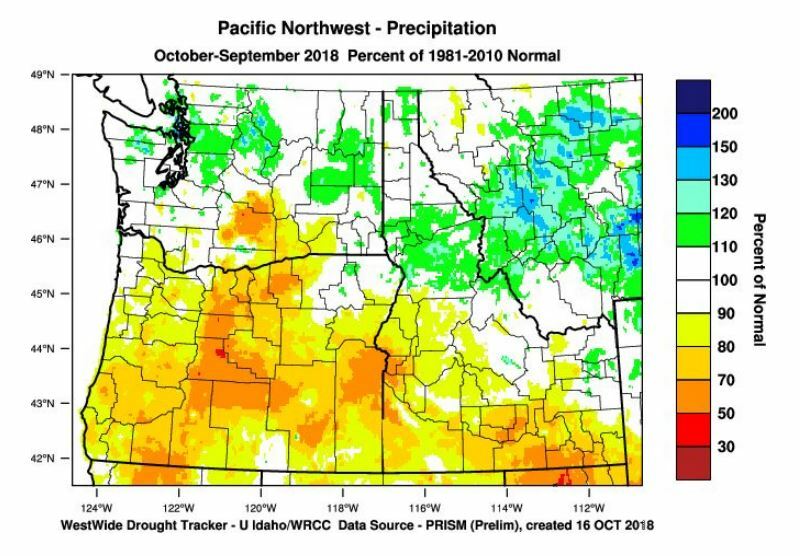 Abundant fall precipitation erased drought conditions during early stages of the 2018 Water Year. 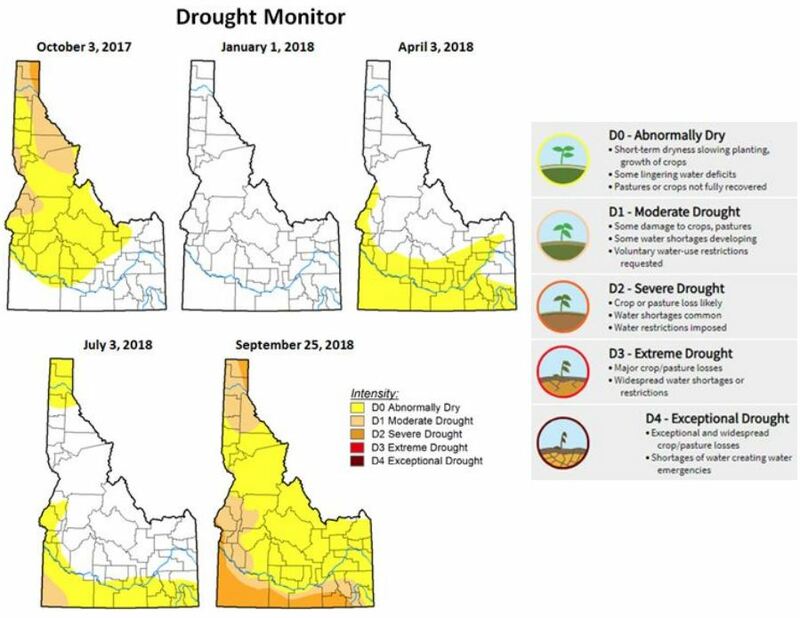 However, above normal temperatures, subpar snowpack, and limited spring rains across the south allowed drought to creep back into the picture by late spring over southwest Idaho. As has been the trend in recent years, above normal temperatures and below normal precipitation dominated through the summer. This allowed drought to expand across southern Idaho into the West Central Mountains as well as the Panhandle Region.